, a very learned dissenting clergyman, was born at Hawkhurst, in Kent, June 6, 1684. He was educated for some time at a dissenter’s academy in London, by the Rev. 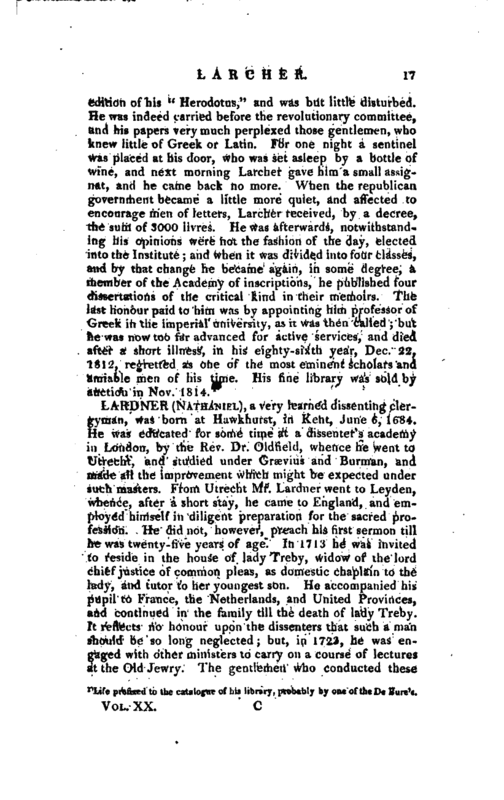 Dr. Oldfield, whence he went to Utrecht, and studied under Grsevius and Burman, and made all the improvement which might be expected under such masters. From Utrecht Mr. Lardner went to Leyden, whence, after a short stay, he came to England, and employed himself in diligent preparation for the sacred profession. He did not, however, preach his first sermon till he was twenty-five years of age. In 1713 he was invited to reside in the house of lady Treby, widow of the lord chief justice of common pleas, as domestic chaplain to the lady, and tutor to her youngest son. He accompanied his pupil to France, the Netherlands, and United Provinces, and continued in the family till the death of lady Treby. It reflects no honour upon the dissenters that such a man should be so long neglected; but, in 1723, he was engaged with other ministers to carry on a course of lectures at the Old Jewry. The gentlemen who conducted these | lectures preached a course of sermons on the evidences of natural and revealed religion. The proof of the credibility of the gospel history was assigned to Mr Lardner, and he delivered three sermons on this subject, which probably laid the foundation of his great work, as from this period he was diligently engaged in writing the first part of the Credibility. In 1727 he published, in two volumes octavo, the first part of “The Credibility of the Gospel History; or the facts occasionally mentioned in the New Testament, confirmed by passages of ancient authors who were contemporary with our Saviour, or his apostles, or lived near their time.” It is unnecessary to say how well these volumes were received by the learned world, without any distinction of sect or party. Notwithstanding, however, his great merit, Mr. Lardner was forty-five years of age before he obtained a settlement among the dissenters; but, in 1729, he was invited by the congregation of Crutcbedfriars to be assistant to their minister. At this period the enthusiasm of Mr. Woolston introduced an important controversy. In various absurd publications he treated the miracles of our Saviour with extreme licentiousness. 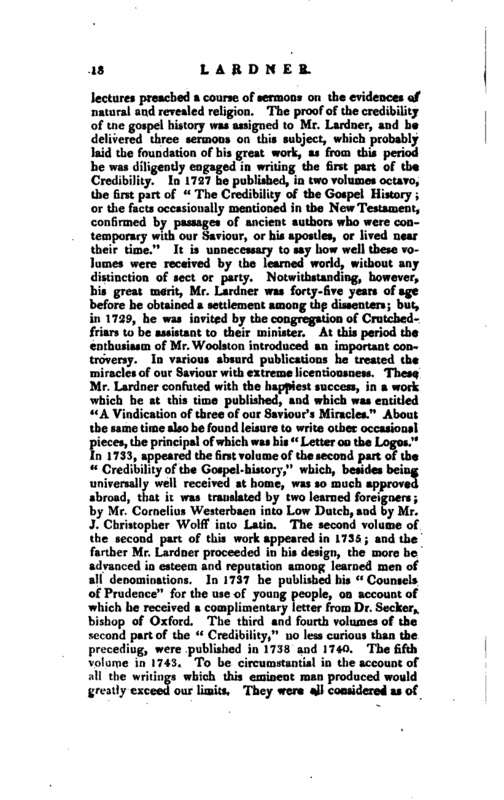 These Mr. Lardner confuted with the happiest success, in a work which he at this time published, and which was entitled “A Vindication of three of our Saviour’s Miracles.” About the same time also he found leisure to write other occasional pieces, the principal of which was his “Letter on the Logos.” In 1733, appeared the first volume of the second part of the “Credibility of the Gospel-history,” which, besides being universally well received at home, was so much approved abroad, that it was translated by two learned foreigners; by Mr. Cornelius Westerbaen into Low Dutch, and by Mr. J. Christopher Wolff into Latin. The second volume of the second part of this work appeared in 1735; and the farther Mr. Lardner proceeded in his design, the more he advanced in esteem and reputation among learned men of all denominations. In 1737 he published his “Counsels of Prudence” for the use of young people, on account of which he received a complimentary letter from Dr. Seeker, bishop of Oxford. The third and fourth volumes of the second part of the “Credibility,” no less curious than the precediug, were published in 1738 and 1740. The fifth volume in 1743. To be circumstantial in the account of all the writings which this eminent man produced would greatly exceed our limits. They were all considered as of | distinguished usefulness and merit. We may in particular notice the “Supplement to the Credibility,” which has a place in the collection of treatises published by Dr. Watson, bishop of Llandaff. Notwithstanding Dr. Lardner’s life and pen were so long and so usefully devoted to the public, he never rfceived any adequate recompence. The college of Aberdeen conferred on him the degree of doctor of divinity, and the diploma had the unanimous signature of the professors. But his salary as a preacher was inconsiderable, and his works often published to his loss instead of gain. Dr. Lardner lived to a very advanced age, and, with the exception of his hearing, retained the use of his faculties to the last, in a remarkably perfect degree. In 1768 he fell into a gradual decline, which carried him off in a few weeks, at Hawkhurst, his native place, at the age of eighty-five. He had, previously to his last illness, parted with the copy-right of his great work for the miserable sum of 150l. but he hoped if the booksellers had the whole interest of his labours, they would then do their utmost to promote the sale of a work that could not fail to be useful in promoting the interests of his fellow creatures, by promulgating the great truths of Christianity. 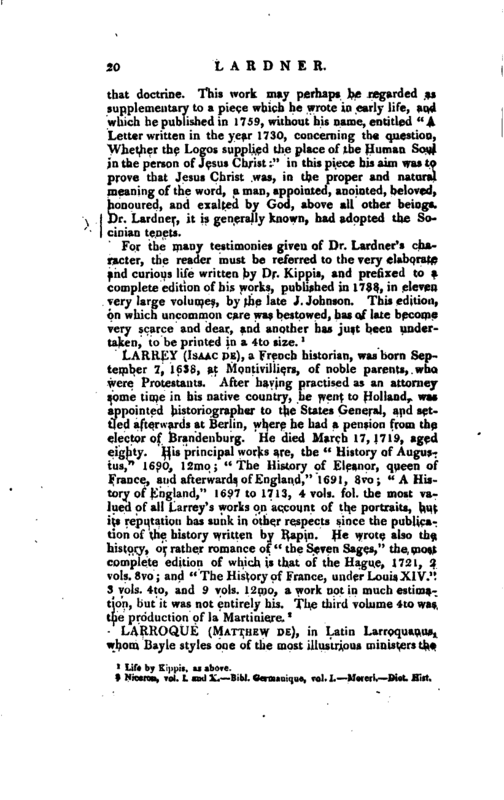 After the death of Dr. Lardner, some of his posthumous pieces made their appearance; of these the first consist of eight sermons, and brief memoirs of the author. In 1776 was published a short letter which the doctor had written in 1762, “Upon the Personality of the Spirit.” It was part of his design, with regard to “The Credibility of the Gospel History,” to give an account of the heretics of the first two centuries. 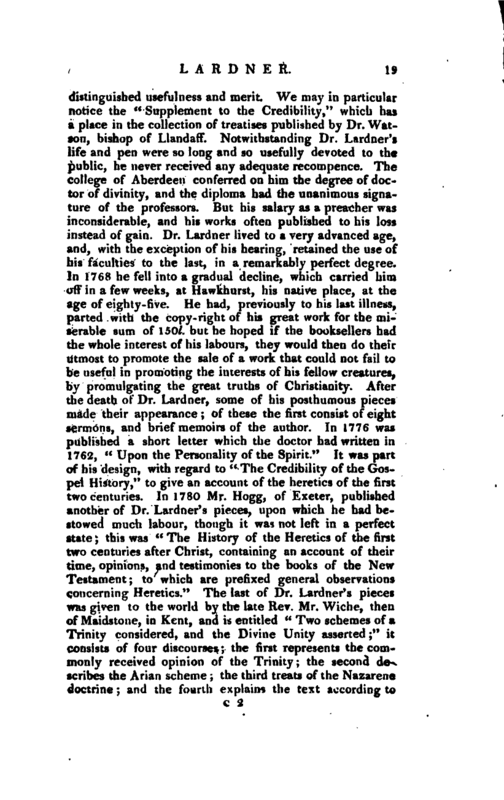 In 1780 Mr. Hogg, of Exeter, published another of Dr. Lardner' s pieces, upon which he had bestowed much labour, though it was not left in a perfect state; this was “The History of the Heretics of the first two centuries after Christ, containing an account of their time, opinions, and testimonies to the books of the New Testament; to which are prefixed general observations concerning Heretics.” The last of Dr. Lardner’s pieces was given to the world by the late Rev. Mr. Wicbe, then of Muidstone, in Kent, and is entitled “Two schemes of a Trinity considered, and the Divine Unity asserted;” it consists of four discourses; the first represents the commonly received opinion of the Trinity; the second describes the Arian scheme the third treats of the Nazarene doctrine and the fourth explains the text according to | that doctrine. This work may perhaps be regarded as Supplementary to a piece which he wrote in early life, and which he published in 1759, without his name, entitled “A Letter written in the year 1730, concerning the question, Whether the Logos supplied the place of the Human Soul in the person of Jesus Christ:” in this piece his aim was to prove that Jesus Christ was, in the proper and natural meaning of the word, a man, appointed, anointed, beloved, honoured, and exalted by God, above all other beings. Dr. Lardner, it is generally known, had adopted the Socinian tenets. Life by Kippis, as above.